First of all I want to thank everyone who entered this wonderful giveaway sponsored by Pfaltzgraff. So many of you have such beautiful memories and stories about Pfaltzgraff dinnerware, they all touched my heart, and if I were a millionaire you I would give each and everyone of you a set of this beautiful dinnerware. 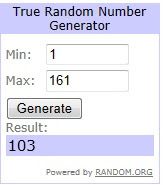 But there can be only one winner, so using the free online random number generator provided by www.random.org I plugged in the whopping 161 entries and the lucky number it gave me was number 103, and that belongs to Dee from the blog A Lapin Life! Again thank you all for your participation...gosh you made this the largest giveaway 21 Rosemary Lane has ever had! Have a wonderful week and wishing everyone a beautiful Thanksgiving along with a dynamite start to the holiday season! Oh, bummer. Congrats to Dee though! Thank you so much Barbara! I was jumping up and down when I found out I won!!! The dishes are gorgeous and I can't wait to start using them. Have a super wonderful Thanksgiving!